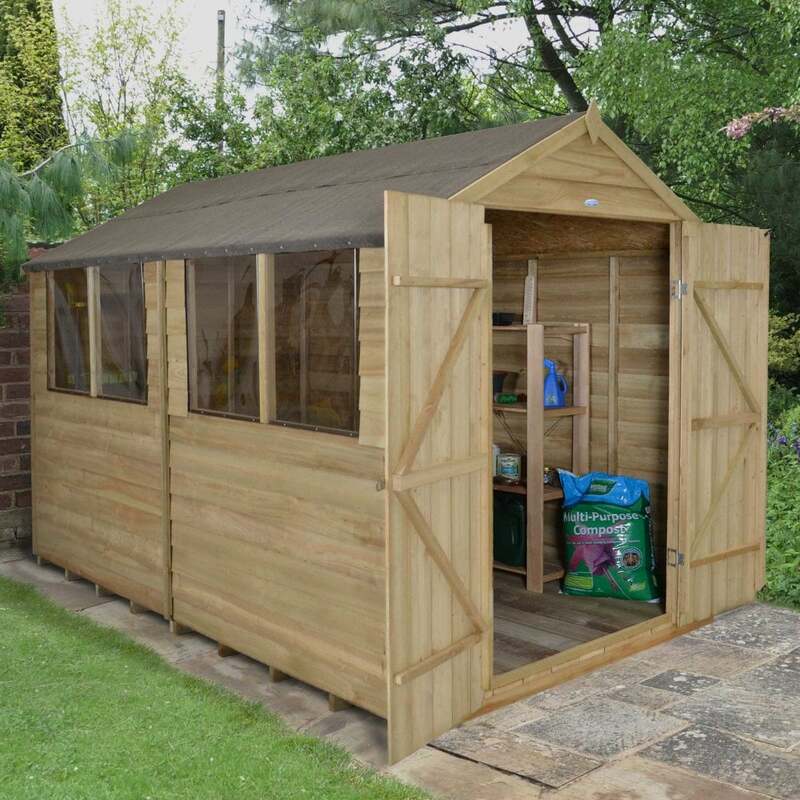 Forest Garden 8 x 10 Overlap Pressure Treated Apex Shed: This Forest Garden 8 x 10 overlap pressure treated apex shed will provide you with ample storage space for a full range of garden tools and equipment. This shed has a traditional apex roof design which will never go out of style. This shed is delivered in a flat packed form which is easier to handle and requires simple assembly by at least 2 people. This wooden garden shed includes attractive smooth planed finials and barge boards and the overlap timber is rough sawn and square cut to enable to rainwater to roll off the sides. This shed has 4 polycarbonate glazed windows which will not go brittle over time and security screws to hold the windows in place, and a double door which has Z framing giving it added strength and stability. This shed has an OSB sheet material roof and a boarded pressure treated floor to give it added durability. This Forest Garden shed includes shed felt roofing material and will be delivered in kit form for simple self-assembly by at least 2 people.